Timaking is the creator and principal artist of "Afuganisu-tan", originally a webcomic and then published in print by SansaiBooks. 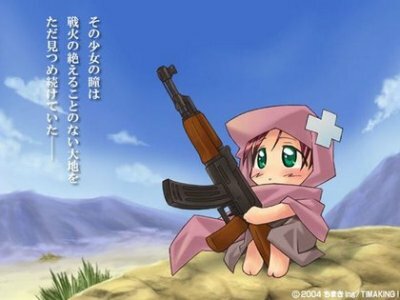 His idea was to express the sociopolitical background of the current War Against Terror in Afghanistan through moe anthropomorphism; a very common device in Japanese manga and anime. The storyline is in 26 parts and basically follows the trials and tribulations of poor little Afuganisu-tan through history as she is bullied by her older, stronger and more avaricious neighbors. As we enter the modern era, Afugan (for short) is forced to leave her home, which is then occupied by a group of stray cats - Al Qaida. To quote the text, "The boss of the stray cats that settled in Afugan's house, was really hated by Meriken." The story may be somewhat eyebrow-raising for us in the West as it is told not from our viewpoint, but from what Timaking as a Japanese thinks is the view of Afghanistan's people. Some have also criticized the manga treatment for trivializing the events of 9-11. 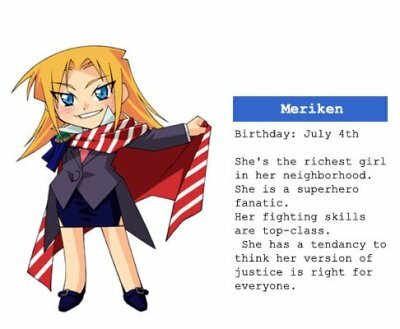 For example, in episode 23 we see Meriken lounging on the White House lawn, drink in hand, sweetly saying "The world was made for me"... as the Bin Laden kitty-cat sneaks up from behind to bite her on the arm. 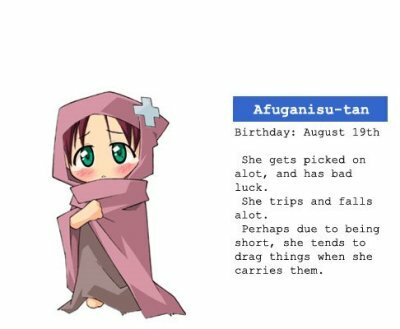 "Afuganisu-tan" is written in a way that explains the many Japanese expressions used in most manga comics, such as "sooo" for creeping up quietly and "taa" for scurrying away. English-speakers as well as Japanese can follow the storyline with ease. It should be mentioned that the original website is now offline but one may read the individual manga pages at this site. Tokyo Game Show 2009 Booth Companions Shatter Stereotypes - NOT! It's redundant to say "manga comic," as manga or 漫画 (まんが) means "comic" in Japanese. This moe style is not very popular in Japan. For the most part, only geek like it, and sometimes it is used for children. This is what i mean about taking a deep breath and seeing the world through another culture's eyes - in this case, Afghan eyes filtered through the Japanese artist Timaking. Just because somebody else's world view is different, does not mean they "hate" you. Or, that they must be wrong. I have a copy of the tankoban in its original Japanese, and indeed it is not very flattering. The said, it's pretty mild (compared to a burning effigy for example), and the "anti-American" comments occupied only a small portion of the book. Given the climate of the time when the on-line comic was running (gradual argument for invasion of Iraq), it's not surprising Timaking would portray the US as arrogant and self-righteous. Indeed, many people around the world who were "not" our enemies, including ourselves, described the unilateral foreign policies pursued by the U.S. to be "hubris". And 6 years after 9/11, I'm not sure if they were not wrong: Iraq is a growing nightmare, Al Qaida remains on the loose, Afghanistan is playing touchy feely with the Taliban, Pakistan teeters on the edge of chaos (and hates us more than ever), Israel/Palestinian crisis continues to add fuel to the fire, and Iran's nuclear ambition is scaring the hell out of everyone in the region. In the meantime, we've lost much credibility as the standard bearer of freedom, due process, and civil liberty, while our administration is holding fast to the "if you're not for us you're against us" approach for everything from Iraq to Iran to China to the World Court to Climate Change. I too hurt when I hear outsiders blaming America (first or last, thinking or not), especially when they touch on something as tender and traumatic as 9/11, but how much did we bring that on ourselves over these last 7 years, which could only reinforce the very negative image people like Timaking, that is people who are "not" our enemies, nevertheless feel compelled to portray us as? the copies of this comic that i see online appear to have all original text removed and to be rewritten in an american style. if it's so important to see through another culture's eyes, why must everything be americanised. seems a little hypocritical. So many can say whatever they want because they havent seen it first hand. But some of us *cough* have. And the locals love us. its the outsiders who come in and cause trouble, trying to 'suade the media and general public in thier favor. War is nasty, civilians will get killed sometimes, but thats the way it is. Someone has to do it, and we just so happen to be "damned if we do, damned if we dont." Were criticized for droppin the hammer , and were criticized when we hold back (yet supply the majority of UN "peacekeepers" , what a joke. the UN hasnt stopped a war since it has been created.) . So stay classy, Meriken. You know what you got and you know how to use it!